Actor and clown, was born in Madrid, Spain. He studied political science and administration at the Complutense University in Madrid and at the Humboldt University in Berlin. He began his acting training in Madrid at the Actors Studio with Marina Wainer and the Chilean Master Juan Carlos Montagna. He started working as an actor/model for the Agency Kailash and appeared in a series of short films such as Room 4 Rent, directed by Shermin Vogshmir. He combined his acting training with dancing, learning different styles throughout the years at schools like El Horno, Danzas del Mundo and Carmen Senra in Madrid. In 2005 he traveled to New York City where he completed his acting training at the renowned HB Studio with school teachers like Austin Pendleton, Carol Rosenfeld, Aleksey Burago or Rochelle Oliver. He studied with master dubbing Manuel Herrera and worked for the company NY Audioworks dubbing different classic cartoons for the Spanish market. As a stage actor he has participated in productions like Sweet Charity at the Ephrata Playhouse, My mother told me I was different, from the Fresh Fruit Festival, Death of a Governments clerk, Life is a Dream at the Spanish Repertory Theater and worked for companies such as NewVillage Productions, HB Playwrights Foundation. Among his most important works we can mention Cotton Candy, written and directed by Diana Chery Ramírez produced by Teatro Circulo or Playgrounded, written and directed by Irina Abraham Elenianova. 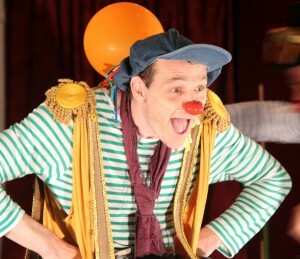 In 2010 he started his training as a Clown with Pedro Serka and after a year of working in hospitals, parks, and fundraiser events he gave birth to his own clown Claus at the Spanish Benevolent Society and through the opening of the show Bolo and Claus and The Green Dragon.